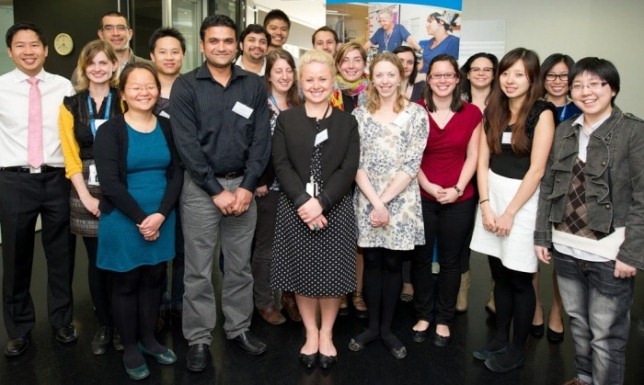 In 2012, Central Clinical School (CCS), in association with Alfred Health, the Burnet and BakerIDI research institutes, had approximately 120 postgraduate students undertaking medical research in a wide variety of subject areas, ranging from basic research to translational clinical settings. To see students in particular departments, click on the department links below. Investigating the long term effects of TBI on the immune and fibrinolytic system. Apoptosis and its regulation in myelodysplasia - using basic mouse models and human samples. Pulmonary hypertension in chronic obstructive pulmonary disease. Dyslipidaemia resulting from obesity is a major contributor to the onset and progression of Type 2 diabetes. New diagnostic and therapeutic strategies in thrombosis and inflammation. Role of antioxidant and PE3K(p110a) approaches for rescuing diabetic cardiomyopathy. Epigenetic regulation of the human survival of motor neuron gene in spinal muscular atrophy. Epigenetic basis for persistence of hyperglycemic variability in mouse embryonic stem cells. Management of irritable bowel syndrome and enteral nutrition associated diarrhoea by reducing intake of poorly absorbed sugars. The function of leucocyte-specific tetraspanins CD37 and CD53 in the immune system. Dendritic cells: development, tolerance and immunity. A novel cross-species study. Investigating the neural correlates of brain stimulation on neurocognition. Is dysfunction of the serotonin system responsible for L-DOPA induced dyskinesias in Parkinson's disease? Hypertension induced inflammation in the endothelium: The signalling pathways involved. Can dietitians turn around the obesity epidemic? Myocardial fibrosis and function after heart transplantation- factors involved in myocardial collagen turnover and relationship to clinical symptoms and outcome. The potential for organ donation in Australia - what is really possible? Attitudes, beliefs and experiences of genetic testing: A study of the haemophilia community.